The Bible teaches us that all of humanity came from common ancestors, Adam and Eve. Although this concept has been balked at throughout history DNA is beginning to show the common ancestry of all human beings. 1999 news magazines began to publish articles about "Mitochondrial Eve" which represents "that woman whose mitochondrial DNA (with mutations) exists in all the humans now living on Earth." The implications of both the television research special and contemporary discovers reinforce what we already know form the Bible, that we came from common descendants and all people are created in the image of God. Human differences come from culture (ethnicity) and not biology. If you needed an organ transplant, it would matter little whether than organ came from someone from Asia, the Middle East, Africa or North America. Human beings are largely the same, except for minor differences in appearance. Scientists have found that if you take people from anywhere in the world and match them with each other the difference between those two people wold be 0.2%. 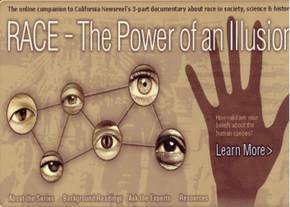 And the major "visible" differences (skin color, eye shape, hair) amounts to about 6% of the 0.2 percent. People are people, created in the Image of God! The concepts of the 'races" as we know it, comes more from the wickedness of the human heart (which always likes to think itself superior to 'somebody' else) and Darwinian evolution and social evolution than from known modern science. Evolution attempted in Darwin's day to show how the far the different "races" were from their original ancestors: apes. This viewpoint has lead to horrible human rights issues and even Hitler attempting to grow a "super-race" purified of all elements he found distasteful. Moving away form the Bible has its consequences. God loves all people, although not everybody loves God. This is our mission. To remind people (or tell them for the first time) that they are valuable, made in God's Image and that God loves them and does have a wonderful plan for their life! The next time you find somebody or a group of people you don't like, remember you are related to them somewhere down the line! That's probably why Jesus reminded us to love our neighbors as ourselves! Who would have thought of it? Somebody did, the folks at Flamingo Road Church. We mentioned their website in our study of First John as we looked at what John had to tell us about the value of confessing our sin. We also talked about Donald Miller and his book Blue Like Jazz, where while in college they set up a confessional booth on campus. Not so students could confess their sins, but so the Christians could confess what lousy Christians they had been on campus. Confession is always good. Check out the news story CNN did on the church's website. It's a lot of fun. Click here to watch. And of course don't miss the I've Screwed Up website. Maybe you have something you need to confess! Click here. Should We Teach the Bible in Public Schools? Yes! According to the editorial staff at Time Magazine. Well, of course they aren't the only ones that advocate teaching the Bible in public schools, but it's a strong stand for a news weekly. They also spend some time discussing the idea that the Bible 'needs' to be taught in public school forwarded by Boston University professor Stephen Prothero, the author of "Religious Literacy." Prothero argues that studying the Bible in public schools "is essential to be a full fledged, well rounded citizen" in the United States. * "It is the bedrock of Western Civilization." * It is constitutional as long as we don't preach it." * The Bible so pervades western culture, that it is hard to call anyone educated who hasn't at least given thought to its key passages." * According to Religious Literacy (the book previously quoted) polls show that nearly two-thirds of Americans believe the Bible holds the answers to 'all or most of life's basic questions.'" * "Simply put, the Bible is the most influential book ever written." * "Not only is the Bible the best selling book of all time, it is the best-selling book of the year every year." * The article makes the point that it is more important to study the Bible than to study Shakespeare, since Shakespeare alludes to scripture over 1,300 times. How can you understand Shakespeare if you don't know the Bible? * Martin Luther King's "I Have Dream" speech (which you can listen to in full on this blog) was consciously enlisting the Old Testament prophet Amos. * The Bible provided the underpinnings of the women's rights and prison reform movements in America. - "The Bible and Public Schools: A First Amendment Guide"
- As soon as I finished this post I saw this article about Texas trying to get eh Bible taught in the schools there. Check it out and do teh same in yor school system. Call your school boards and get the Bible in your school system. Why should we be the last to jump on an increasing national trend? Besides the Bible rocks! 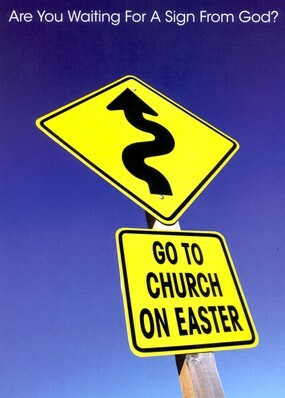 During the seasons of Christmas and Easter (Easter more than Christmas) Jesus becomes a commodity. A way to sell advertising, magazines, drive people to television programs (which sell advertising) and even a way to drive people to art galleries, as we see this year with the display of "The Chocolate Jesus" (which has now been canceled. But Jesus is a powerful name and even with the cancellation the gallery and the sculptor as more well known than ever. Jesus can do a LOT of people and even galleries. Even when they aren't promoting the historical Jesus or the Savior. Here's the ones I'm following and will have some remarks to make daily during "Holy Week" -as they call it- the week preceding Easter daily here on the blog. Check everyday for a new article that you can talk about at work, with friends and family and to build you up in the faith that cannot be refuted! Or stopped! Jesus rules! Still! 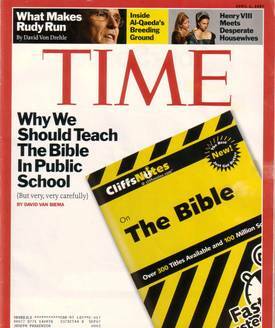 1) Time Magazine's cover article "Why We Should Teach the Bible in Public School (But very, very carefully)"
2) The Chocolate Jesus. Hey let's face it, Jesus IS good. Way better than chocolate! Some artist, sculpted a life size, anatonomically correct Jesus out of choclate (not the one to the left, so the artist isn't even original) and was to display it at a mid-town mManhaattan gallery daily during "Holy Week." Thankfully it isn't happening. 3) Anderson Cooper's "What is a Christian?" I don't like CNN that much, but I tend to like the Anderson Cooper specials, so we'll see. Wednesday and Thursday night @ 10:00. At least he's smart enough to not try and go up against "American Idol." 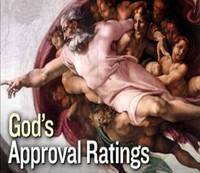 4) God's Approval Rating covered this week in Newsweek Magazine / MSNBC. Believe me, God isn't sitting in heaven biting his fingernails hoping more people will vote for Him and believe in Him. But Americans are incurably religious. There is still hope for us as a nation! 5) "What's So Special About Jesus?" will be the title of Easter Service. I'll post a trifold towards the end of the week that will be suitable to give to friends and family. Several months ago I gave a book to all of our elders by Donald Miller called "To Own a Dragon: Reflections of Growing Up Without a Father." It was unlike anything I'd read before. I got extra copies to give to other guys in the church as well. I got two reactions: (1) WoW! (2) "What was I supposed to get out of that?" Well, Donald Miller had a huge impact on me and he has really helped me to love people more. And we all could use some more of that! My sister posted these new assumptions by Donald Miller. You can read them on her blog by clicking here, or you can read them right here. She posted them first, so due credit to her at www.rejoycing.blogspot.com Cool name for a blog huh? re-Joycing? Her name is Joyce!! So here are Donald Miller's "Shift Points." I'm certain at least a few will speak to you as they spoke to me. Enjoy your changed life! Simply coming to the understanding that the world does not revolve around “me” but that everybody is having an experience, created by God, loved by God, and that we needed to repent of showing partiality. religious or philosophical idea not on logical conclusions, but on whether or not the idea creates a “good person”…the definition of a good person being whether or not a person is kind to them, tolerant and understanding, able to listen without arguing and so on. hostility, that many people have been hurt by the church, or people or perspectives they believed to represent God. Many times it's as simple as an interview they saw on CNN, but an apology and kindness went a long way in helping people understand God was loving. We came to understand that Christians do not own morality, that everybody lives by a moral code, not always informed by an ancient text, and yet it is there. Calling people or even thinking of them as immoral was, then, inappropriate. In fact, we often found that people who did not know Christ lived a morality close to his heart in many areas we had ignored, ie; community, tolerance, social justice, fairness and equality, freedom, beauty and so on. Often the morality of others overlapped Christian morality, and we came to understand that in these cases, we would focus on the overlapping issues. We came to see this as kindness, just as though we were on a date or making friends, we did not focus on what we didn’t have in common, but rather on mutual feelings about life. We would not say or do anything to combat people unless they knew we loved them, and this takes a great deal of time. We were careful about Christian sayings and phrases that might be offensive: Crusade, sin, immorality….we came to understand that concepts were more sacred than terms. We were careful not to try to “build our organization” and respected peoples freedom and space. Sharing the gospel became an exercise in friendship, rather than an attempt to grow a machine. Often, people feel used if they feel they are being recruited. 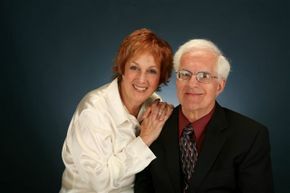 The gospel, we learned, is really about them, their feelings about God and truth, about sin, about life. We realized that in telling somebody about Jesus, we were telling them about somebody we have come to love and need, and about something that had happened to us, an encounter. This keeps us from sounding preachy, and allows us to share part of ourselves in a friendship. Our organization was not exclusive. We invited non-believers into the community if they wanted to be invited. We were careful not to not be ourselves with them, but they were certainly invited and enjoyed being a part of the group. We explained terms that we used, what we believed, but other than that, continued as normal. We discovered that many people have been offended or hurt by what they perceive Christianity to be. We allowed ourselves to stand in the place of “Christianity” and apologize whenever necessary. We discovered the need to be as honest about our lives as possible. We did not feel the need to sell Jesus, as much as share what He has done in our broken lives. We had no problem sharing our doubts and fears about faith, along with our commitment and appreciation for what God had done. We discovered the need to pray for others. This would insure God was working in peoples lives, as we asked Him to. We discovered the work of evangelism is something God lets us watch, but very little of it is what we manipulate. We repented of not believing evangelism was a spiritual exchange between a lost person and God, rather than believing it was a series of ideas we were supposed to convince others of. We decided to initiate, whenever the relationship called for it. We were not afraid to ask people if they would like to know God. Yawn! --- Finding the Tomb of Jesus? The Good News is that Jesus is still attractive. 2,000 years later and people are still interested in Him. Of course! His is the only name by which people can be saved and there is a spot in the heart of every person that longs for Jesus. The real Jesus that is. But did they find the tomb of Jesus? OK, let's take a look! * The documentary is produced by Oscar winner James Cameron, who is best known for his work on "Titanic" (the highest grossing film of all time.) Cameron was the one that conceived the "Terminator" series, which grew out of a dream he had of a machine that came from the future and out of fire to kill him. * In his production, "The Lost Tomb of Christ" he draws attention to ten ancient caskets that were discovered in a suburb of Jerusalem in 1980. What?!?! 1980?!?? These things have been around since 1980? Why hasn't anybody picked up on this before now? * The BBC aired a documentary on the story and the supposed Jesus connection in 1996. The whole thing is old news and hasn't received any widespread support in any of the archaeological or academic communities. It's simply good controversy and it makes for exciting documentaries. * Bar-Ilan University Prof. Amos Kloner, the Jerusalem District archaeologist who officially oversaw the work at the tomb in 1980 and has published detailed findings on its contents, on Saturday night dismissed the claims. 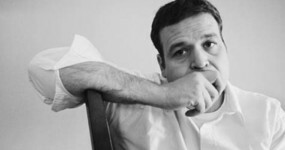 "It makes a great story for a TV film," he told The Jerusalem Post. "But it's impossible. It's nonsense." Fox News quoted Kloner as saying, "They just want to get money for it." * Academic Stephen Pfann, a scholar at the University of the Holy Land in Jerusalem, said he did not expect Christians to accept the film's findings. "I don't think that Christians are going to buy into this," said Mr Pfann, who was interviewed by the film-makers. "But sceptics, in general, would like to see something that pokes holes into the story that so many people hold dear." * Some Jerusalem residents are very excited about the find. "It will mean our house prices will go up because Christians will want to live here," one woman said. * The Jerusalem Post reports, "The film also suggests that the so-called "James, Brother of Jesus" ossuary, which surfaced in 2002 in the collection of Israeli antiquities collector Oded Golan, may also have come from the tomb. The "James" ossuary made world headlines, but has been branded a forgery by the Israel Antiquities Authority..."
* Jerusalem-based biblical anthropologist Joe Zias goes a step further to discredit Cameron's documentary. "What they've done here," Zias said, "is they've simply tried in a very, very dishonest way to try to con the public into believing that this is the tomb of Jesus or Jesus' family. It has nothing whatsoever to do with Jesus." * According to the filmmaker "the tomb of Jesus" may have come from the same tomb as the now famous "James Ossuary Hoax" which turned out to be a fraud ending in the arrests of five individuals trying to pull off an archaeological hoax in order to make money. An AP Report tells us, "Archaeologists also balk at the filmmaker's claim that the James Ossuary _ the center of a famous antiquities fraud in Israel _ might have originated from the same cave. 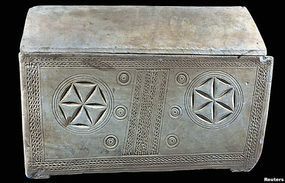 In 2005, Israel charged five suspects with forgery in connection with the infamous bone box." * Darrell Bock, a professor at Dallas Seminary, whom the Discovery Channel had vet the film two weeks ago, adds another objection: why would Jesus's family or followers bury his bones in a family plot and "then turn around and preach that he had been physically raised from the dead?" If that objection smacks secular readers as relying too heavily on scripture, then Bock's larger point is still trenchant: "I told them that there were too many assumptions being claimed as discoveries, and that they were trying to connect dots that didn't belong together." Everybody is jumping on the bandwagon. Time Magazine, CNN, FOX, the BBC. It's interesting that none of the major media outlets are really buying the story. As we approach the Passover and Easter season, we're reminded again that Jesus did rise from the dead, a fact attested to in history. Many have tried to disprove it, undermine it or minimize. Yet the risen Jesus continues to change lives and save souls! Finding the tomb? Well, the Bible tells us that Jesus WAS laid in a tomb. The Good News is He didn't stay there, but was raised in three days, never to die again. He tasted death for us, so that we could experience eternal life through Him. For anyone really interested in the tomb of Jesus, read this paper by Dr William Lane Craig. Jesus was laid in a tomb, but now He is gone. My prayer is that James Cameron DOES find Jesus! What a joy that would be for him!